A glamorous soirée in the iconic Cullman Hall of the Universe on Central Park West was the setting of a star-studded charity drive by luxury Swiss watchmaker TAG Heuer and its Hollywood brand ambassadors Cameron Diaz and Leonardo DiCaprio. The exclusive event, held below the dramatic glass-cubed planetarium sphere in the American Museum of Natural History, brought together NY and Hollywood celebrities, business, fashion and media leaders from around the world and key figures of the international jet-set for a double-pronged charity push: to raise funds for the victims of Hurricane Sandy, and raise awareness for gender equality and the empowerment of women worldwide. The 500 guests in attendance, many of whom flew in expressly for the high-profile event, were regaled by a special performance of the New York City Ballet, before dancing the night away to the music of New York’s red-hot DJ Evalicious. For each guest, TAG Heuer pledged $100 to New York Cares’ Hurricane Sandy Relief Fund, and a further $100 to Cameron Diaz’s partner charity, UN Women (The United Nations Entity for Gender Equality and the Empowerment of Women). The event marks the first time that TAG Heuer Ambassadors Cameron Diaz and Leonardo DiCaprio combined forces for a TAG Heuer celebrity event. Welcomed on stage by thunderous applause, Cameron proudly displayed her new LINK Lady Trilogy Limited Edition in steel, and was wearing a stunning Lanvin dress. 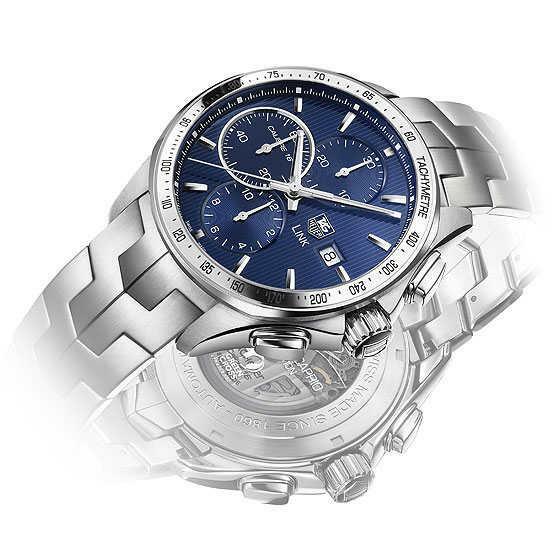 On Leonardo’s wrist, he wore the new Link Limited Edition with blue dial. On stage, TAG Heuer President and CEO Jean-Christophe Babin offered to Cameron a yellow gold version of the trilogy, an exclusive set of watch and jewellery. “Our hearts and prayers go out to the victims of Hurricane Sandy. Their resiliency in the face of such adversity is a true inspiration, as is the outpouring of support from communities worldwide. We’re proud to support New York Cares as it is the largest local volunteer organization dedicated to supporting those impacted by this devastating storm.” TAG Heuer President and CEO Jean-Christophe Babin. During the prestigious “place-to-be” event, TAG Heuer showcased its new collection of limited edition LINK timepieces and jewelry. 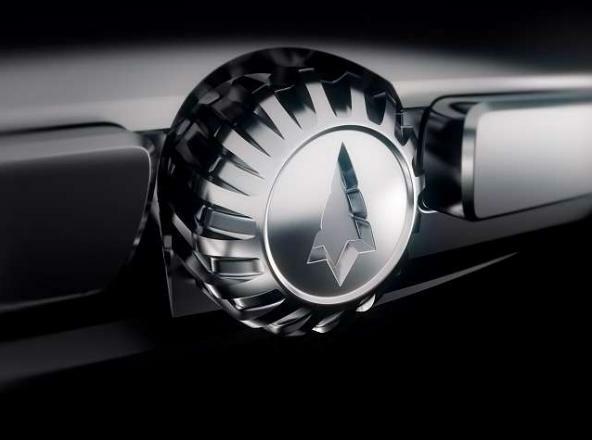 A benchmark of avant-garde design and ultimate comfort since 1987, the LINK’s newest incarnations are: the Ladies’ LINK Automatic Watch, the first automatic watch for women offered in the LINK Lady line; the LINK Lady Trilogy, a limited edition watch, ring and bracelet set co-designed by Cameron Diaz; and the “Leonardo DiCaprio” LINK Calibre 16 Chronograph, a limited edition chronograph signed on its smoked sapphire caseback by Leonardo DiCaprio. Profits from the sale of the stunning Link Lady Trilogy will go to support UN Women, while proceeds from the blue-dial LDC Limited Edition Link’s sales will go to Leonardo DiCaprio’s environmental charity partners, Green Cross International and the Natural Resources Defense Council ( NRDC). Nestled in a jewel box are three elements--the LINK Lady watch, ring and bracelet--co-designed by actress Cameron Diaz. 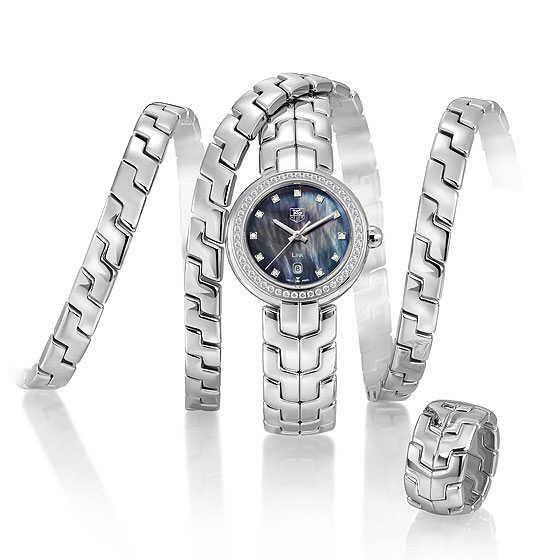 The S-shaped links of the watch’s iconic bracelet are echoed in the the exquisite double-S links of the ring and the single-S links of the bracelet. All three, forged in the line’s signature polished stainless steel, catch the light and sparkle all day, and all night. Wear one, wear all: alone or ensemble, the three stellar bijoux, like the versatile TAG Heuer Ambassador whose signature graces the watch’s caseback, radiate star power. 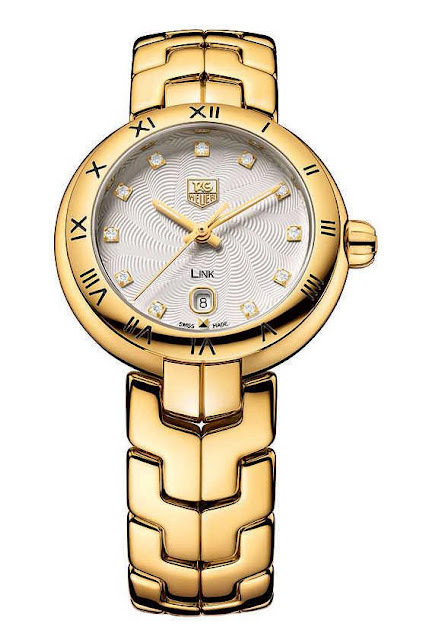 The LINK Lady Automatic is the first automatic watch for women in the LINK Collection.The case is rounded and highly polished, reminiscent of a river stone. The dial design is delicately refined, with date window at 6 o’clock, and a stunning guilloche pattern of concentric lines across the face. The powerful movement is visible through the transparent sapphire caseback. A covetable collectible for watch lovers and connoisseurs, the gorgeous 34.5mm timepiece with full diamond bezel is one of the most ultra-feminine creations ever produced by the brand. The second model of DuBois et fils is another step to restart the brand, which currently makes it possible for watch lovers to join the company via crowd funding and to become a part of the oldest watch factory in Switzerland. 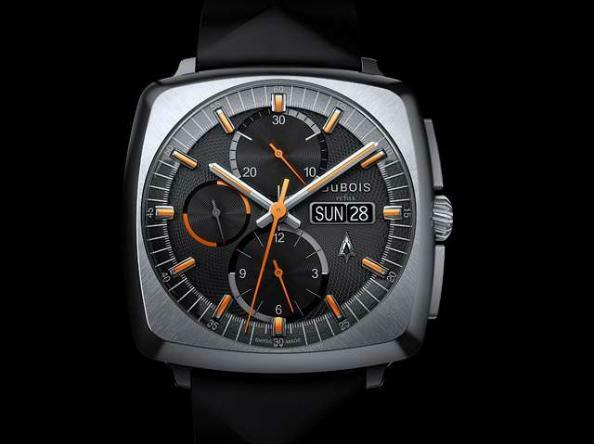 Now concept TWO from DuBois et fils presents a chronograph that the company says evokes memories of the 70s. 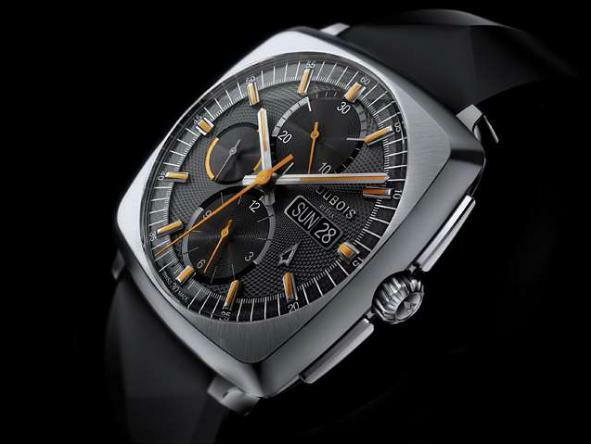 Powered by a Valjoux 7750, Concept TWO focuses on the most trusted chronograph movement from Switzerland. In addition to the dial with orange accents, the case provides a visual match between the matt sunray bezel and the polished body. The case is 316L stainless steel. Under the sapphire crystal, the dial shows a guilloche honeycomb pattern, the recessed totalisers of the chronograph and the running seconds are milled. With the orange luminous material the hands and indexes are equipped in style. Date and day display are matching the dial with white letters on a black background. The second model of DuBois et fils has a more sporty look than the first watch, Concept ONE. "The new model reminds of the 70s, a difficult time for the mechanical watch. At that time, the quartz flood came with an enormous price decline that caused many problems for companies and factories," says Thomas Steinemann, owner and CEO of DuBois et fils. The company has been producing watches in Switzerland since 1785, however the concept is completely new: watch lovers can purchase one of the various shareholder packages and therefore become part of the oldest watch factory in Switzerland. At the same time the shareholders have the privilege to buy the new watches which are limited to 99 pieces per model at a reduced price. Philippe DuBois & Fils SA is the oldest watch factory in Switzerland. For 2013, a new collection of quality watches limited to just 99 watches per model is planned. 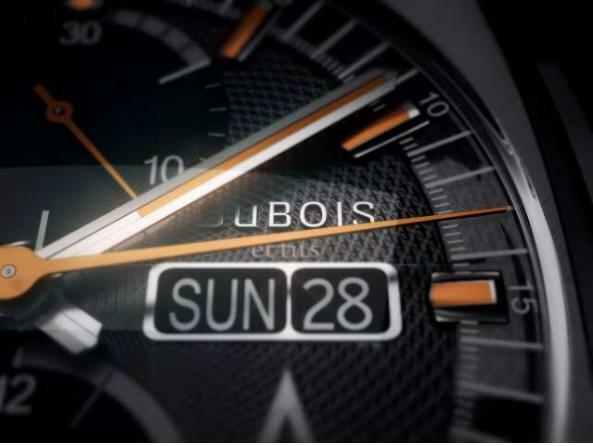 In addition to that, watch lovers have the unique opportunity to be part of DuBois et fils. They are able to acquire shares of the factory at a discount model by a crowdfunding project. Different packages enable the costumers to enter the world of watches. A professional team headed by CEO Thomas Steinemann designs the watch collection, continuing the tradition of DuBois et fils.